Chemical injuries are commonly encountered following exposure to acids and alkali, including hydrofluoric acid (HF), formic acid, anhydrous ammonia, cement, and phenol. Other specific chemical agents that cause chemical burns include white phosphorus, elemental metals, nitrates, hydrocarbons, and tar. Health departments from 5 states (Colorado, Iowa, Michigan, New Hampshire, and Wisconsin) evaluated 3,125 emergency chemical-release events involving 4,034 hazardous substances that occurred from 1990-1992. Of these events, 77% involved stationary facilities and 23% were transportation-related. In 88% of events, a single chemical was released. The most commonly released hazardous substances were volatile organic compounds (18%), herbicides (15%), acids (14%), and ammonia (11%). These events resulted in 1,446 injuries and 11 deaths. Respiratory irritation (37%) and eye irritation (23%) were the most commonly reported symptoms. Chemical exposures also can occur at home or as the result of an attack. Many common products once believed to be innocuous (eg, cement, gasoline) are now regarded as potentially hazardous and as the cause of serious injury and illness. Exposure to these agents can be reduced significantly through educational programs, cautionary labeling of toxic products, and appropriate use of protective clothing. When poison control centers identify new products that are toxic to skin, information is added to the regional poison information system to ensure that injured patients are given the benefit of new data. Concomitantly, this information is shared with the manufacturer and Consumer Product Safety Commission (CPSC) to recognize and address the problem nationally. For example, numerous cases of serious permanent injury and, occasionally, death caused by exposure to sulfuric acid drain cleaners have been recorded by the CPSC. As a result of this alarming problem, the CPSC currently proposes banning the sale of this product to consumers. For excellent patient education resources, visit eMedicineHealth's First Aid and Injuries Center. Also, see eMedicineHealth's patient education articles Chemical Burns and Thermal (Heat or Fire) Burns. Most chemical agents damage the skin by producing a chemical reaction rather than hyperthermic injury. Although some chemicals produce considerable heat as the result of an exothermic reaction when they come into contact with water, their ability to produce direct chemical changes on the skin accounts for most significant injury. Specific chemical changes depend on the agent, including acids, alkalis, corrosives, oxidizing and reducing agents, desiccants and vesicants, and protoplasmic poisons. The concentration of toxic agent and duration of its contact primarily determine the degree of skin destruction. When the skin is exposed to toxic chemicals, its keratinous covering is destroyed, and underlying dermal tissues are exposed to continuous necrotizing action. Both inorganic and organic acids denature the proteins of the skin, resulting in a coagulum, the color of which depends on the acid involved. Nitric acid burns result in a yellow eschar, whereas sulfuric acid eschar is black or brown. Burns caused by hydrochloric acid or phenol tend to range from white to grayish-brown. Following the initial exposure, cellular dehydration and further protein denaturation/coagulation occur. This dehydrative effect results in the characteristic dry surface of acid burns. The method(s) of neutralization used in the treatment of acid burns depend on the nature of the acid. Alkali burns are those caused by lime (cement), ammonia, and caustics (sodium hydroxide, potassium hydroxide). Alkali dissolves protein and collagen, resulting in alkaline complexes of these molecules. Cellular dehydration (as in acid burns) and saponification of fatty tissue also occurs. Whereas acid burns are characterized as "dry" burns, with little fluid loss or edema, alkali burns present with marked edema and extensive fluid loss. Neutralization of alkali exposure is accomplished by first irrigating the burned site with a large amount of water to dilute any unreacted alkali remaining on the wound surface. This protects the wound from further damage caused by heat released during the neutralization reaction. After skin contact, absorption of some agents may cause systemic toxicity. Dichromate poisoning produces liver failure, acute tubular necrosis, and death. Oxalic acid and HF injuries may result in hypocalcemia. Tannic and phosphorous burns may be followed by nephrotoxicity. Absorption of phenol may be associated with CNS depression and hypotension. Inhalation injury may result from exposure to toxic fumes, particularly when the exposure occurs within a closed space. Hazardous materials (HAZMAT) are substances that may injure life and damage environment if improperly handled. These substances can be encountered in the home, in urban (industrial) areas, in rural (agricultural) areas, or anywhere involving the release of hazardous material. HAZMAT accidents are particularly dangerous for responding personnel, who are in danger of exposure from the time of arrival on the scene until containment of the accident. The surrounding community also is commonly endangered. The Superfund Amendment and Reauthorization Act (SARA) mandates community preparedness for dealing with HAZMAT accidents. Before a community develops its plans for responding to HAZMAT accidents, it needs to determine what types of materials are likely to be involved. For those exposed to potentially dangerous chemicals at home, it is best to remove the chemical from the anatomic site by irrigation with copious amounts of water. A friend or relative must then telephone the regional poison control center certified by the American Association of Poison Control Centers. [3, 4] If the chemical is judged dangerous, make arrangements to transfer the exposed person to the nearest emergency department (ED) for definitive care. Notify the ED as soon as possible after the accident to allow staff to prepare to receive the patient. Paramedics and members of the HAZMAT response team (usually firefighters) must work together to identify toxic chemicals and assess hazardous environments. Placards, shipping papers, United Nations chemical identification numbers, and markings on shipping containers help identify hazardous agents. In some cases, members of the HAZMAT team may have to use chemical analysis to identify the agent. The presence of carbon monoxide, cyanide, hydrogen sulfide, oxygen, and combustible gases can be detected using different instruments. Colorimetric detector tubes can approximate the concentrations of chemicals in the air. Alpha, beta, and gamma radiation detectors can record radioactive contamination. Contacting the 24-hour hotline of Chemtrec (Chemical Manufacturers Association, Washington, DC, 1-800-424-9300) can provide helpful information regarding identification and management of HAZMAT. At the scene of the incident, members of the HAZMAT team should wear a self-contained breathing apparatus (SCBA) and protective apparel. The contingency plan for HAZMAT management can be divided into 2 parts: initiation of the site plan and evacuation. Initiation of the site plan begins after identifying HAZMAT and assessing the surrounding environment. Once HAZMAT is identified, determine health risks to the environment. A command post away from the exposure site is essential to a large incident involving HAZMAT, because it allows paramedics, HAZMAT team members, firefighters, police, representatives from state and local government, and manufacturer and shipper to coordinate activities. In coping with HAZMAT incidents, 2 distinct goals must be achieved concomitantly. First, HAZMAT must be contained, fire and explosions must be extinguished, and the site eventually must be cleaned. Second, those exposed to HAZMAT must be treated. The first priority in the care of people exposed to HAZMAT is decontamination, which is initiated by removing the victim's clothes and isolating them in plastic bags. Liquid chemicals are washed off the victim's body with water, whereas dry chemicals are first brushed off, followed by copious water irrigation delivered under low pressures. Priority of decontamination should progress from cleansing of contaminated wounds to eyes, mucous membranes, skin, and hair. While performing decontamination, conduct a primary and secondary survey of the patient to detect life-threatening injuries and take appropriate steps to stabilize the patient's condition (eg, administer oxygen to dyspneic patients). Ideally, patients should be thoroughly decontaminated before arrival in the ED. Hospital personnel involved in decontamination should wear chemical-resistant clothing with built-in hood and boots, at least 2 layers of gloves, protective eyewear, and some form of respiratory protection. The minimum level of respiratory protection for hospital personnel during decontamination has not been established. Chemical burns continue to destroy tissue until the causative agent is inactivated or removed. For example, when hydrotherapy is initiated within 1 minute after skin contact with either an acid or alkali, severity of the skin injury is far less than when treatment is delayed for 3 minutes. Early treatment is followed by a return of skin pH to normal. When contact time exceeds 1 hour, the pH level of a sodium hydroxide (NaOH) burn cannot be reversed. Similarly, brief washing of a hydrochloric acid (HCl) burn more than 15 minutes after exposure does not significantly alter acidity of damaged skin. Because contact time is a critical determinant of the severity of injury for skin exposed to a toxic liquid chemical, an exposed person or a witness to the injury must initiate hydrotherapy immediately. When workers' clothes are soaked with such agents, valuable time is lost if their clothing is removed before copious washing commences. Gentle irrigation with a large volume of water under low pressure for a long time dilutes the toxic agent and washes it out of the skin. During hydrotherapy, the rescuer should remove the patient's clothes and wear powder-free, latex-free, emergency medical examination gloves to prevent hand contact with the chemical(s). Emergency medical technicians, paramedics, firefighters, and emergency department (ED) personnel must wear latex-free emergency medical examination gloves to avoid eliciting an allergic reaction in the latex-sensitized patient. Most emergency medical technicians, paramedics, and firefighters are now wearing powder-free emergency medical examination gloves that comply with the stringent codes and standards established by the National Fire Protection Association (NFPA), while very few hospital ED personnel have been provided with NFPA-approved gloves. Four well-defined goals assist emergency medical services, fire departments, and hospitals in the selection and purchase of emergency medical examination gloves. First, the purchasing department must understand the stringent regulations for such gloves outlined by the NFPA. This design and performance standard was devised by the NFPA to address protective clothing for emergency medical operations. The requirements were described by the NFPA in 1999, in Standard on Protective Clothing for Emergency Medical Operations, 1997 edition. The revised 2003 edition can be viewed here. Design requirements emphasize that at least 5 different sizes of gloves must be available. Performance requirements include liquid-tight integrity, biopenetration resistance, puncture resistance, soluble latex protein content, dexterity, and ultimate elongation and tensile strength. Second, the purchasing department must be familiar with the 2 certification organizations that certify that emergency medical examination gloves comply with the stringent NFPA design and performance requirements reviewed in the 2003 edition. Recommendations have been made to the NFPA committee to revise the 2003 edition to contain more information on the design and performance requirements for emergency medical examination gloves. Familiarity with these certification organizations allows the purchasing agents of fire departments, ambulance services, and hospital EDs to select the best powder-free emergency medical examination gloves for their health care workers. Third, purchasing agents must have information about the certified manufacturers of emergency medical examination gloves that can assist purchasing organizations in the glove selection process. Finally, the exemplary efforts of FirstLine LLC (Buellton, Ca) in providing comprehensive information about the performance and specification of a wide range of emergency medical examination gloves should be emphasized. The fit of the glove as well as its textured finish are key considerations in the selection of emergency medical examination gloves. Note that the uniform fit of the Intercept Elite nitrile emergency medical examination glove extends beyond the wrist crease. Remember that the finger tips of these nitrile gloves have a finish that enhances the dexterity of the emergency medical health care worker. After exposure to strong alkali, prolonged hydrotherapy is especially important to limit severity of injury. In experimental animals, the pH level of chemically burned skin does not approach normal concentration unless more than 1 hour of continuous irrigation has been maintained, and it often does not return to normal for 12 hours despite hydrotherapy. This differs from HCl skin burns, in which the pH level usually returns to normal within 2 hours after initiating hydrotherapy. The mechanism by which NaOH maintains an alkaline pH level despite treatment is related to byproducts of its chemical reaction to skin. Alkalis combine with proteins or fats in tissue to form soluble protein complexes or soaps. These complexes permit passage of hydroxyl ions deep into the tissue, limiting their contact with water diluent on the skin surface. Conversely, acids do not form complexes, and their free hydrogen ions are easily neutralized. Regardless of causative agent, continue hydrotherapy once the patient arrives in the ED. If the chemical is localized in the patient's hand, immerse the injured part in a sink under flowing tap water. For other anatomic sites, place them supine in a hydrotherapy tank in which the temperature of the water can be regulated. Continue hydrotherapy treatment for 2-3 hours for acid burns and for at least 12 hours for strong alkali burns. When the patient's clothing comes in contact with solid chemical (eg, lye), remove contaminated clothing before instituting hydrotherapy. Remove all visible solid particles from the patient's skin during copious irrigation with water. Deliver water to the wound at the lowest possible pressure, because high-pressure irrigation (shower) may disperse liquid or solid chemical into the patient's or rescuer's eyes. Water is the agent of choice for decontaminating acid and alkali skin burns. Deleterious effects of attempting to neutralize acid and alkali burns were first noted in experimental animals in 1927. In every instance, animals with alkali or acid burns that were washed with water survived longer than animals treated with chemical neutralizers. The additional trauma of the heat generated by the neutralization reaction superimposed on the already existing burn accounts for the striking difference between the results of these 2 treatment methods. The same effect may occur when certain chemicals contact water, yet large volumes of water tend to limit this exothermic reaction. Surgeons are beginning to question the belief that neutralization of an alkaline burn of the skin with acid does, indeed, increase tissue damage due to the exothermic nature of acid-based reactions. In experimental studies in animals, surgeons demonstrated that topical treatment of alkaline burns with a weak acid such as 5% acetic acid (ie, household vinegar) resulted in rapid tissue neutralization and reduction of tissue injury in comparison to water irrigation alone. The observed benefits of treating alkaline burns with 5% acetic acid in the rat model are significant and require clinical testing. Acid and alkali injuries involving the eye are among the most disastrous of chemical burns. Regardless of the nature of chemical involved, the primary goal is to immediately institute copious irrigation. At the scene of the injury, the exposed person should submerge his or her eyes in a container of tap water and continuously open and close them. In the absence of a container, hold face and eyes beneath a faucet and continuously irrigate with water. If possible, maintain irrigation during transport to hospital. In the ED, subject the eye to immediate hydrotherapy. This is most easily accomplished using a low-flow stream of 0.9% NaCl from intravenous (IV) tubing. The patient's response to chemical spillage into the eye can frustrate emergency treatment: responses include severe blepharospasm, tearing, and forceful rubbing of the eye. Topical anesthetic agents help limit pain and improve patient cooperation. Lid retractors may be necessary to evert eyelids and ensure adequate evaluation and irrigation of conjunctival sac. First, remove any foreign material or solid chemical. Continue irrigation until the pH level of the conjunctival sac returns to its physiologic level (pH 7.4). Monitor the pH level of the conjunctival sac with a Ninhydrin reagent strip. Compare the pH levels of the affected and unaffected eye. After irrigation, stain eyes with fluorescein to detect corneal injury. Then perform slit-lamp examination of the eye with corneal injury to determine the extent of damage to the anterior segment of the eye and anterior third of the vitreous chamber. Initial slit-lamp examination of alkali burn often reveals corneal erosion, swelling of the corneal epithelium, and clouding of the anterior chamber. Treat all eyes that demonstrate corneal abrasion with a broad-spectrum antibiotic emollient instilled in the conjunctival sac (eg, chloramphenicol, gentamicin). Ophthalmologic consultation and close follow-up care are warranted in all significant exposures, and hospitalization for continuous irrigation occasionally may be required. (For more information, see Medscape Reference article Ophthalmologic Approach to Chemical Burns.) Measure intraocular pressure serially to detect pressure increases. Occasionally treat the injured eye with long-acting cycloplegic, mydriatic, and carbonic anhydrase inhibitor for 2 weeks or until pain disappears. This treatment decreases the potential for pupillary constriction, increased intraocular pressure, and early glaucoma. Encourage mobility of the globe to avoid development of conjunctival adhesions (symblepharon). Ocular chemical injury remains one of the most difficult ocular emergencies. The prognosis for a burned eye depends not only on the severity of the injury, but also on the rapidity and mode of treatment. Recently, amniotic membrane patching (AMP) has been demonstrated to be useful toward achieving a desirable outcome for acute ocular chemical burns. The human placenta was obtained shortly after elective caesarean delivery from a donor mother. Human immunodeficiency virus, hepatitis virus type B, hepatitis virus type C, and syphilis were serologically excluded. Temporary AMP with modifications in suture placement was performed in patients inflicted with acute chemical injury. Clinical results suggest that immediate AMP is quite useful for managing moderately severe acute ocular chemical injury by facilitating rapid epithelialization and pain relief and by securing ocular surface integrity. Alkali substances are the most toxic chemicals, and anhydrous ammonia appears to be the worst offender. Even alkali burns that seem mild can result in devastating injury, because alkalis tend to react with the lipid in corneal epithelial cells to form soluble soap that penetrates corneal stroma. Alkali moves rapidly through the stroma and endothelial cells to enter the anterior chamber. Anhydrous ammonia can penetrate the anterior chamber in less than 1 minute. Alkali usually kills each tissue layer of the anterior segment of the eye that it contacts. This results in occlusive vasculitis around the corneoscleral limbus, which makes repair of these tissues difficult. As the tissues of the anterior segment of the eye degenerate, perforation follows with the development of endophthalmitis and loss of the eye. If perforation can be prevented, recovery of sight may be possible through eventual corneal transplantation. Recent experimental studies conclude that destruction of corneal stroma can be minimized by drug therapy (eg, N-acetylcysteine, steroids). However, drug therapy has limited therapeutic usefulness because of the need for frequent applications, significant number of clinical failures, and potential adverse effects. Corrosive esophagitis has been a long-lasting problem, especially in olive-producing areas. In recent years, household lye products have come into routine use and have unfortunately been associated with increased frequency of caustic esophagitis induced by accidental ingestion. Frequently, the concentration of the ingested agent is unknown because of the absence of manufacturers' labels on the containers. The victims are usually children in families of low socioeconomic status. The ingestion of lye can cause serious injury to the esophagus, frequently causing corrosive esophagitis and the even more serious complication of esophageal strictures. Esophageal burns vary in burn location, burn length, burn severity, admission time after ingestion, and complications. Consequently, the management of these injuries has been a challenge to pediatric surgeons and the gastroenterologist. In cases of severe burns and when difficulty was encountered with antegrade dilatation, a gastrostomy was performed with a trans-stricture string, followed by antegrade string-guided dilation of the stricture. Initial dilation was performed with a dilator 1-2 sizes smaller than the estimated diameter of the stricture. In general, the patients were only dilatated 2-3 French (F) sizes larger than the first dilator that met resistance per dilation session. Patients with recalcitrant esophageal strictures were entered into their esophageal stenting treatment program. In cases that did not respond to 3 consecutive dilations, gastrostomy and esophageal stenting were performed. Polytetrafluoroethylene (PTFE) intraluminal stenting was used to treat serious cases. The esophageal stent was inserted 12 weeks after caustic ingestion. The length and caliber of the esophageal stricture was determined by esophagoscopy. PTFE esophageal stent was custom-made for each patient. The length of the strictured segment of the esophagus was measured; the stent was made 2 cm longer so that the stent would overlap 1 cm beyond the stricture on each end when correctly positioned. Both ends of the stent were secured to a 4F ureteral catheter with zero polypropylene. The proximal part of the ureteral catheter was fixed to the nose, while the distal part was fixed to the gastrostomy tube. If gastroesophageal reflux was diagnosed with 24-hour pH monitoring before or during the stenting period, a Collis gastroplasty was performed. During the stenting period, the patients underwent barium esophagogram every 2 months. No esophagoscopy was performed in this period. The esophageal stenting program was terminated after 9-14 months of stenting. All patients were swallowing fluids and semisolid foods easily. The most severe complication was esophageal perforation. Ingestion of caustic agents often causes severe corrosive gastritis, in which ulceration is most extensive in the antrum. Early perforation with peritonitis and late cicatricial stenosis with thickening of the gastric wall are the most important complications of corrosive gastritis. Kamijo et al reported the case of a patient in whom high-resolution images of the gastric wall were obtained by endoscopic ultrasonography (EUS). This visualization documented severe corrosive gastritis and helped to predict the development of antral stenosis, which ultimately required surgical intervention. The patient was subsequently treated with a laparoscopic gastrectomy. Eyes tolerate acid burns better because like other living tissue, they have significant acid-buffering capacity. Tear film, the proteins present in tears, and conjunctival epithelial cells rapidly neutralize acid. Consequently, acid typically causes epithelial and basement membrane damage, yet rarely damages deep endothelial cells. Acid burns that injure the periphery of the cornea and conjunctiva often heal uneventfully, leaving a clear corneal epithelium. In contrast, acid burns of the central part of the cornea may lead to corneal ulcer formation with neovascularization and scarring, requiring later reconstruction. During 1985 and 1986, the American Association of Poison Control Centers Data Collection System received 2367 reports of human exposures to hydrofluoric acid (HF). [13, 14] Four fatalities occurred, three from ingestion and one as a result of dermal exposure. Significant local and systemic toxicity can result from exposure of eye, skin, or lung to HF. HF is one of the strongest inorganic acids. Its use is mainly industrial, involving glass etching, metal cleaning, electronic industries, and biochemical laboratories. However, it can also be found in households as a component of rust removers and aluminum-cleaning products. Because of these numerous applications, there is a large risk for accidental human exposure to HF. In the United States, more than 1000 incidents of accidental exposures to HF are reported annually. The risk and potential toxicity associated with such exposure are often underestimated by persons handling this liquid in households, laboratories, and industrial plants. Significant local and systemic toxicity can result from exposures of the eyes, skin, or lungs to HF. Inhalation of HF vapor is rare and usually involves explosions that produce fumes or high concentrations of liquid HF (>50%) that soak the clothing of the upper body. Patient outcomes vary considerably depending on concentration and duration of exposure to HF. Inhalation and skin exposure to 70% HF has caused pulmonary edema and death within 2 hours. Pulmonary injuries that are not evident until several days after exposure also can occur. The patient has no respiratory symptoms and a normal chest radiograph initially, yet massive purulent tracheobronchitis that is refractory to treatment may develop. Respiratory symptoms may persist for months after inhalation of HF fumes. Sustained irritation of the larynx and pharynx with fibrinous, granulating deposits on thickened vocal cords may cause persistent cough and hoarseness. Management of inhalation exposure involves removing the patient from the source, then decontaminating clothes and skin. [15, 16] If respiratory symptoms are present, monitor the patient with pulse oximetry, administer humidified oxygen using a nonrebreathing reservoir bag mask system, and evaluate him or her for laryngeal edema, pneumonitis, pulmonary edema, pulmonary hemorrhage, and systemic toxicity. Treatment of HF inhalation injury is primarily symptomatic. Administration of 2.5-3% calcium gluconate solution by nebulizer as therapy for inhalation of HF has been suggested but not tested. Admit asymptomatic patients with possible HF inhalation for observation. Eye exposure to HF vapors produces more extensive damage than that of other acids at similar concentration. The extent of damage by HF depends on its concentration. Exposure of rabbits to 0.5% HF causes mild initial conjunctival ischemia that resolves in 10 days; 8% HF causes severe initial ischemia that is still noted after 65 days. Corneal opacification and necrosis occur after exposure to 20% HF. Initiate immediate and copious irrigation of the exposed eyes at the scene of exposure and continue for at least 30 minutes during transport to the ED, where an ophthalmologic examination can be performed promptly. Local ophthalmic anesthetic drops enhance patient comfort and cooperation during irrigation and evaluation. In experimental animals, single irrigations with 1 L of water, isotonic saline, or magnesium chloride are the only treatments that are therapeutically beneficial without causing toxicity. Benefits include decreased epithelial loss and reduced corneal inflammation. Repeated irrigations over time have no therapeutic merit and are associated with an increased occurrence of corneal ulceration. Patients with significant ocular exposure to HF should be seen emergently by an ophthalmologist. A large number of personnel in industry and research handle concentrated solutions of HF. Relatively dilute solutions of HF (0.6-12%) are available to the public in the form of rust removal and aluminum cleaning products. During handling of containers holding HF, inadvertent contamination of unprotected fingers and hands often occurs, resulting in chemical burn injury. HF skin burns have certain distinct characteristics. First, exposure causes progressive tissue destruction associated with intense pain that can be delayed in onset for hours and can persist for days if untreated. Skin at the site of contact develops a tough, coagulated appearance. Untreated sites progress to indurated, whitish, and blistered vesicles that contain caseous, necrotic tissue. In exposure of the digits, HF has a predilection for subungual tissue. Severe untreated burns may progress to full-thickness burns and may even result in loss of digits. Initial treatment of HF skin exposure is immediate irrigation with copious amounts of water or a saturated solution of sodium bicarbonate for at least 15-30 minutes. Most exposures to dilute solutions of HF respond favorably to immediate irrigation. Severe pain or any pain that persists after irrigation denotes a more severe burn that requires detoxification of fluoride ion by promoting the formation of an insoluble calcium salt. Remove all blisters first because necrotic tissue may harbor fluoride ions. Then detoxify fluoride ion through topical treatment, local infiltrative therapy, or intra-arterial infusion of calcium. Calcium gluconate (2.5%) gel is the preferred topical agent. Because skin is impermeable to calcium, topical treatment is effective only for mild, superficial burns. Because this gel is not stocked in most hospital pharmacies, it must be formulated by mixing 3.5 g of calcium gluconate powder in 150 mL of water-soluble lubricant (eg, K-Y Jelly). An occlusive cover (eg, latex glove) should secure the gel. Infiltrative therapy is necessary to adequately treat deep and painful HF burns. Calcium gluconate is the agent of choice and can be administered either by direct infiltration or intra-arterial injection. A commonly used technique involves injecting 10% calcium gluconate subcutaneously through a 30-gauge needle at a maximum dose of 0.5 mL/cm2 of skin. Using 5% calcium gluconate made by diluting the aforementioned solution with an equal amount of isotonic saline recently has been shown to reduce irritation of tissues and decrease subsequent scarring. Hospitalize patients receiving this treatment for observation and toxicologic consultation. Despite its wide acceptance, the infiltration technique has notable disadvantages, especially when treating digits. A regional nerve block is recommended because injections may be very painful. Removal of the nail to expose the nail bed is required if subungual tissue is involved. Vascular compromise can occur if excessive fluid is injected into skin exposure sites, and unbound calcium ions have a direct toxic effect on tissue. Place an intraarterial catheter in the appropriate vascular supply close to the site of HF exposure (eg, radial, ulnar, brachial, carotid artery). A variety of dilute solutions of calcium salts have been infused over 4 hours, including the following: (1) 10-mL solution of 10% calcium gluconate or calcium chloride mixed in 40-50 mL of D5W, repeated if pain returns within 4 hours; (2) 10-mL solution of 20% calcium gluconate in 40 mL of normal saline for radial or ulnar artery infusion; and (3) 20 mL of 20% calcium gluconate in 80 mL of normal saline for brachial artery infusion, repeated at 12-hour intervals if needed. If more than 6 hours have elapsed since the time of HF exposure, tissue necrosis cannot be prevented, even though pain relief can occur up to 24 hours after exposure. As with direct infiltration, the intra-arterial infusion technique has potential disadvantages. The procedure may induce arterial spasm or thrombosis, resulting in significant skin loss. It is also more costly because it requires hospitalization for use of the infusion pump and monitoring of serum calcium if repeated infusions are used. HF binds calcium and magnesium with strong affinity. Systemic fluoride toxicity, including dysrhythmias and hypocalcemia, can occur from ingestion, inhalation, or dermal exposure to HF. Consequently, all patients with significant HF exposure should be hospitalized and monitored for cardiac dysrhythmias and electrolyte status for 24-48 hours. Hypocalcemia can occur after significant exposures to HF and should be corrected with 10% calcium gluconate administered intravenously. If left untreated, a burn caused by 7 mL of 99% HF can theoretically bind all available calcium in a 70-kg man. Prolonged QT interval on electrocardiogram is a reliable indicator of hypocalcemia. Formic acid is a caustic organic acid used in industry and agriculture. [18, 19, 20] It causes cutaneous injury by coagulation necrosis. Systemic toxicity occurs after absorption and manifests as acidosis, hemolysis, and hemoglobinuria. Hemolysis is the result of the direct effect of formic acid on red blood cells. Institute copious wound lavage immediately. Treat acidosis with sodium bicarbonate. Mannitol may be used to expand plasma volume and promote osmotic diuresis in patients with hemolysis. Exchange transfusions and hemodialysis may be needed in patients with severe formic acid poisoning. Ammonia is used in the manufacture of explosives, petroleum, cyanide, plastic, and synthetic fibers. In addition, it is widely used as a cleaning agent and as a coolant in refrigerator units. As an agricultural fertilizer, ammonia is ideal because of its high nitrogen content (82%). Sudden release of liquid ammonia can cause injury through two different mechanisms. It has an extremely low temperature (-33°C) and freezes any tissue it contacts. Ammonia vapors readily dissolve in the moisture of skin, eyes, oropharynx, and lungs to form hydroxyl ions, which cause chemical burns through liquefaction necrosis. The severity of injury directly relates to the concentration and duration of exposure to ammonia. Treatment consists of prompt irrigation of eyes and skin with water and management of inhalation injury. If necessary, secure the airway by nasal or oral intubation. Use a large diameter tube to prevent distal airway obstruction from sloughing of mucosa. After intubation, manage lower airway injury with positive end expiratory pressure (PEEP) ventilation. Cement burns are alkali burns. When dry cement is combined with water, hydrolysis occurs. Resulting mixture is essentially a solution of slated lime saturated in water with an initial pH of 10-12. As hydrolysis continues, the pH level may continue to rise to 12 or 14, which is comparable to that of sodium, potassium hydroxide, or lye. In addition, contact dermatitis from chromate (a trace element) has been reported. The best treatment of cement burns is immediate copious irrigation until the substance is completely gone, a practice performed by experienced workers who habitually wash off cement throughout the day. Prominent warning labels on packages containing cement products direct the user to wear protective gloves when using the product in either its wet or dry state. Cement burns of the lower extremities respond well to immediate copious irrigation followed by coverage with a medicated bandage (eg, Gelocast Unna boot) that allows patient to ambulate. Phenols are used industrially as starting materials for many organic polymers and plastics. They are used widely in agricultural, cosmetic, and medical fields. Because of their antiseptic properties (first appreciated by Lister), they are used commonly in many commercially available germicidal solutions. A number of phenol derivatives (eg, hexylresorcinol, resorcinol) are more bactericidal than phenol itself. Plastic surgeons use dilute solutions of phenol for chemical facial peels. Phenol (which is usually mixed with water, soap, and croton oil for this application) can produce a partial-thickness burn of predictable depth in a controlled manner. It has been the standard for many years for new technologies in skin resurfacing to remove both coarse and fine wrinkles, irregular facial pigmentation, and actinic keratoses. The concentration of phenol is kept sufficiently low to reduce the occurrence of systemic complications. Interestingly, higher concentrations of phenol result in a shallower burn depth. A higher concentration of phenol results in increased coagulation of the keratin in the skin, thus forming a barrier to further penetration. Histologic studies have demonstrated that 100% concentrations of phenol produce 35-50% less penetration than a 50% phenol solution. The physician performing phenol chemical peels should be concerned about the possibility of rapid phenol absorption. When phenol is applied to more than 50% of the facial surface in less than 30 minutes, a high incidence of cardiac arrhythmias is reported. When the application time over the same area was increased to 60 minutes, arrhythmias were avoided. Because of the complication of cardiac arrhythmias, all patients undergoing phenol peeling should be monitored electrocardiographically and have an intravenous line in place. Following application of the phenol solution, the skin is covered with an occlusive dressing that consists either of multiple layers of waterproof tape or petroleum jelly to prevent evaporation of the phenol, allowing for increased penetration and burn depth. The peeled skin is maintained by daily cleansing and consequent reapplication of ointment, which keeps the surface moist and prevents desiccation. If this protocol is followed, healing is completed within 5-7 days. Phenol is an aromatic acidic alcohol. This compound and its derivatives are highly reactive, corrosive, contact poisons that damage cells by denaturing and precipitating cellular proteins. Their characteristic odor usually signals their presence. After phenol penetrates dermis, it produces necrosis of papillary dermis. This necrotic tissue may temporarily delay its absorption. When skin comes in contact with phenol, institute treatment immediately. Irrigate exposed area with large volumes of water delivered under low pressure. Dilute solutions of phenol are more rapidly absorbed through skin than concentrated ones, thus avoid gentle swabbing of surface of skin with sponges soaked in water. Because phenol may become trapped in the victim's hair or beard, remove any hair that has come into contact with the chemical agent as soon as possible. In animal studies, exposure to as little as 0.625 mg/kg of phenol causes death. In humans, absorbed phenol causes profound CNS depression, resulting in coma and death from respiratory failure. Marked hypotension may occur as a result of central vasomotor depression in addition to a direct effect on the myocardium and small blood vessels. Phenol also is a powerful antipyretic that produces a fall in body temperature. Metabolic acidosis may result from shock as well as from the direct effect of acidic phenol. A number of substituted phenols (eg, resorcinol, picric acid) have systemic actions distinct from that of phenol. Stimulation of CNS is commonly encountered after absorption of resorcinol. Picric acid hemolyzes RBCs and causes acute hemorrhagic glomerulonephritis and acute liver injury. Experimental studies indicate that water alone is effective in reducing the severity of burns and preventing death in animals with skin exposed to phenol and its derivatives. The most effective treatment is undiluted 200-400 molecular weight polyethylene glycol (PEG) or isopropanol. This material should be stocked in hospitals located near areas of phenol use. Often, it can be located in the chemical section of hospital pharmacies. A quick wipe of the skin with PEG solution reduces mortality and burn severity in experimental animals. These solutions can be used in phenol burns of the face because they are not irritating to eyes. Decontaminate with water until the PEG solution is obtained. Use large amounts of water because small amounts are detrimental, enhancing dermal absorption of phenol. Remove phenol in a well-ventilated room to avoid exposing hospital personnel to high concentrations of phenol fumes. Treatment of systemic symptoms is purely symptomatic. Respiratory depression may require ventilatory support. Treat hypotension with isotonic crystalloid fluid and pressor agents as needed. Metabolic acidosis may require treatment with sodium bicarbonate. Alkalinization also prevents the precipitation of hemoglobin in urine that occurs with hemolysis. Administering mannitol intravenously, which causes osmotic diuresis, can enhance hemochromogen excretion in urine. Anticonvulsants may be required to treat seizures resulting from CNS stimulation. White phosphorus is a yellow, waxy, translucent solid element that burns in air unless preserved in oil. When it ignites spontaneously in air, it is oxidized to phosphorous pentoxide, which forms metaphosphoric and orthophosphoric acids with addition of water. Phosphorus can ignite spontaneously in air at temperatures higher than 34°C; this has encouraged its use as an incendiary agent in military weapons and fireworks. After explosion of phosphorous munition, flaming droplets may become embedded beneath skin, where they oxidize adjacent tissue unless removed. In nonmilitary industry, white phosphorus is used in the manufacture of insecticides, rodent poisons, and fertilizers. Tissue injury from exposure to white phosphorous appears to be caused primarily by heat production, rather than by liberation of inorganic acids or cellular dehydration by hygroscopic phosphorous pentoxide. The ultimate result of this thermal injury is often a painful partial or full-thickness burn. Prehospital care should include immediate removal of contaminated clothing followed by submersion of phosphorus-contacted skin in cool water. Avoid warm water because white phosphorous becomes liquid at 44° C. Remove phosphorus particles from victim's skin and submerge in water. Cover burned skin with towels soaked in cool water during transport to the ED. After the patient's arrival in the ED, wash burned skin with a suspension of 5% sodium bicarbonate and 3% copper sulfate in 1% hydroxyethyl cellulose. [25, 26] (This mixture must be made by hospital pharmacies.) Phosphorus particles become coated with black cupric phosphide, allowing for easy identification. Copper sulfate also decreases the rate of oxidation of phosphorus particles, limiting their damage to underlying tissue. Since blackened particles can still elicit tissue injury, they should be removed. If absorbed systemically, copper sulfate is toxic. Absorption of copper sulfate can be minimized by surface-active agent in the aforementioned suspension, as well as by sodium lauryl sulfate. Before the advent of these agents, prolonged treatment of phosphorus burns with copper sulfate solutions led to systemic copper poisoning, which manifests as vomiting, diarrhea, hemolysis, oliguria, hematuria, hepatic necrosis, and cardiopulmonary collapse. After subjecting burned skin to a suspension of copper sulfate for 30 minutes, thoroughly wash the antidote from the skin. Washing limits the development of systemic copper toxicity. An alternative approach is to use a Wood lamp to identify phosphorus particles because they fluoresce under ultraviolet light. Metabolic derangements have been identified in white phosphorous burns. Postburn serum electrolyte changes consist of depression of serum calcium and elevation of serum phosphorus. Also identified are postburn ECG abnormalities, including prolongation of QT interval, bradycardia, and ST-T wave changes. These ECG changes may explain early sudden death occasionally seen in patients with apparently inconsequential white phosphorous burns. After hydrotherapy and treatment with appropriate antidote, definitively manage skin burns in the hospital intensive care unit setting as with any other burn wound. Elemental metals (sodium, potassium) are harmless unless activated by water, which causes an exothermic reaction with the release of heat and generation of hydrogen gas and hydroxide. Evolved heat is sufficient to ignite hydrogen gas, which results in even greater heat and causes additional thermal burns. Furthermore, formation of hydroxide compound may result in significant chemical injury to tissue. Reaction occurs more rapidly with elemental potassium than with sodium. These deleterious effects of potassium have been attributed to trace amounts of potassium superoxide released on exposure to room air. Therefore, water lavage is dangerous in these circumstances. In the prehospital setting, use only a class D fire extinguisher (containing sodium chloride, sodium carbonate, or graphite base) or sand to suppress flames. When the fire is extinguished, metal is covered by oil (eg, mineral oil, cooking oil) to isolate metal from water. Transport the patient to the ED for wound debridement and cleansing. Remove small pieces of metal from the skin. Place sodium fragments in isopropyl alcohol containing no more than 2% water; insert potassium particles into tert butyl alcohol for safe deposit. Toxic methemoglobinemia is a well-recognized hazard of ingestion of nitrates and nitrites. Occasionally, severe methemoglobinemia has been reported in patients sustaining burn injury from molten sodium and potassium nitrates. In these patients, methemoglobinemia is caused by absorption of nitrates through burned skin. Diagnosis of methemoglobinemia should be sought in a cyanotic patient who is unresponsive to oxygen therapy and whose blood appears chocolate brown. Methemoglobin levels lower than 20-30% usually are asymptomatic and require no treatment. Levels higher than 30%, with or without symptoms, should be treated with high-flow oxygen and intravenous methylene blue administered slowly at dose of 1-2 mg/kg body weight. Exchange transfusions also may benefit severe cases by rapidly decreasing circulating methemoglobin concentration. Cutaneous injury from immersion in gasoline and other hydrocarbons may occur in individuals involved in motor vehicle accidents. Solvent properties of hydrocarbons cause cell membrane injury and dissolution of lipids, resulting in skin necrosis. Although full-thickness injuries can occur, most injuries are partial thickness. Once gasoline damages the protective skin barrier, hydrocarbons are absorbed. This produces systemic toxicity leading to neurologic, pulmonary, cardiovascular, GI, and hepatic injuries. Treatment of individuals exposed to gasoline includes immediate removal from site of exposure, removal of all clothing, copious irrigation, and transfer to the ED while continuing copious irrigation. Management in the ED consists of wound care of burn injuries and a search for evidence of systemic toxicity. Burns from hot tar are a challenging clinical problem. [30, 31] Hot liquified tar that contacts skin transfers heat to cause burn injury. Tar then cools and solidifies on the skin surface, making removal difficult. Hot tar includes two distinct groups of materials: coal tar pitches and petroleum-derived asphalts. Both products are heated to maintain liquid form. Paving roads requires tar temperatures from 275-300°F, while roofing demands higher tar temperatures of 450-500°F. Deeper burn injuries are associated with burns from roofing asphalt. Mechanisms of injury include cauldron explosion, falling from buildings, trucks rolling over, pipe explosion, spillage from buckets, and industrial accidents. When hot tar contacts skin, it rapidly cools, solidifies, and becomes enmeshed in the hair. It is important to facilitate this cooling process by adding cold water to the tar at the scene of the accident. Cooling tar with cold water limits the amount of tissue damage and prevents the spread of tar. Tar should be continually washed with water until it has cooled and hardened. After cooling, dry skin with towels to prevent systemic hypothermia. Do not remove adherent tar at the scene of the accident. In the ED, definitive care of tar burn injury involves early removal of tar, because it occludes injured skin and encourages bacterial growth. This can convert a partial-thickness burn to a full-thickness burn. Tar adheres to skin because it is enmeshed in the hair, not because of a direct bond between epidermis and tar. Solvents used to remove tar ideally should have close structural affinity to tar. Asphalts are susceptible to both aromatic (eg, naphthalene) and aliphatic (eg, hexade) hydrocarbon solvents, while coal tars are only susceptible to aromatic hydrocarbons. The cleansing capacity of these solvents is enhanced by prolonged contact with tar. Broad-spectrum antibiotic ointments such as bacitracin (400 U/g), polymyxin B (5000 U/g), and neomycin (5 mg/g) may be added to lower the incidence of infection. Remove antimicrobial petrolatum ointments and reapply every hour until all tar is removed. The process of tar removal usually takes 12-48 hours. Antibiotic ointment has been used successfully to remove even tar layered over corneas and conjunctivas. An alternative to petrolatum ointments is surface-active agents, such as polyoxyethylene sorbitan (Tween 80) and polysorbate (De-Solv-It). These are more water soluble and more easily removed from skin with water than petrolatum ointments. These surface-active agents are an effective, safe, and inexpensive means of removing tar from skin. NISA baby oil, sunflower oil, and butter also have been used to remove adherent tar from skin, taking from 30-90 minutes for complete removal. Sunflower oil has proven effective and safe in removing tar without inflicting further skin damage. During surgery, the surgeon should wear sterile surgical gloves without cornstarch. In 2008, 13 health professionals filed a citizen’s petition with the Food and Drug Administration (FDA) to ban cornstarch powder on all medical gloves. Cornstarch has been documented as promoting wound infection and causing serious peritoneal adhesions and granulomatous peritonitis, and it is a well documented vector of the latex allergy epidemic. The FDA allows 1.5% of surgical gloves to have holes. These holes allow the transmission of blood with deadly viral infections between the patient and the surgeon. 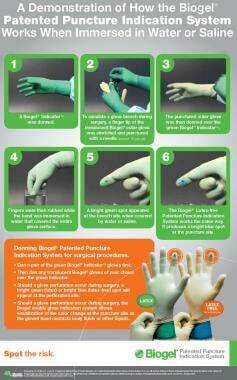 Consequently, the Biogel double-glove hole indication system should be used to detect the location and presence of holes in the gloves, allowing the surgeon to change the gloves when a hole is detected. After surgery has begun, one of the major causes of glove holes is surgical needle penetration, which can be detected by the double-glove hole indication system. In collaboration with Dr. Robert Zura of Duke Medical Center, the authors have developed a poster entitled: A Demonstration of How the Biogel Patented Puncture Indication System Works When Immersed in Water or Saline. Poster for the Biogel puncture indication system. This poster can be framed and placed in the operating room as a guide to the appropriate use of the double-hole indication system during surgery. Copies of the poster can be obtained by contacting Mr. Milt Hinsch at Milt.Hinsch@biogelusa.com. Acid violence (ie, when acid is thrown in someone's face) is a particularly vicious and damaging form of violence. In Bangladesh, the overwhelming majority of victims are women; many of them are younger than 18 years. The victims are attacked for many reasons. In some cases, a young girl or woman has objected to the sexual advances of a young male, or she or her parents have rejected a proposal of marriage. Recently, acid attacks on children, older women, and men have been reported. These attacks are usually the result of family and land disputes. Dowry demands are a desire for revenge. US Environmental Protection Agency (EPA). Superfund Amendments and Reauthorization Act (SARA) Overview. EPA Web site. Available at http://www.epa.gov/superfund/policy/sara.htm. Accessed: August 8, 2007. Annual Report 2001. Agency for Toxic Substances and Disease Registry. Division of Health Studies Epidemiology and Surveillance Branch. Hazardous Substances Emergency Events Surveillance (HSEES). 2001. Watson WA, Litovitz TL, Rodgers GC Jr, Klein-Schwartz W, Youniss J, Rose SR, et al. 2002 annual report of the American Association of Poison Control Centers Toxic Exposure Surveillance System. Am J Emerg Med. 2003 Sep. 21(5):353-421. [Medline]. Litovitz TL, Klein-Schwartz W, Rodgers GC Jr, Cobaugh DJ, Youniss J, Omslaer JC, et al. 2001 Annual report of the American Association of Poison Control Centers Toxic Exposure Surveillance System. Am J Emerg Med. 2002 Sep. 20(5):391-452. [Medline]. Rodeheaver GT, Hiebert JM, Edlich RF. Initial treatment of chemical skin and eye burns. Compr Ther. 1982 May. 8(5):37-43. [Medline]. Edlich RF, Winters KL, Martin ML, Long Iii WB, Werner CL, Gubler KD. Scientific basis for the selection of emergency medical examination gloves for emergency medical technicians, paramedics, firefighters, and emergency department personnel. An update. J Long Term Eff Med Implants. 2005. 15(2):161-83. [Medline]. Davidson EC. The treatment of acid and alkali burns. Ann Surg. 1927. 35:481. Andrews K, Mowlavi A, Milner SM. The treatment of alkaline burns of the skin by neutralization. Plast Reconstr Surg. 2003 May. 111(6):1918-21. [Medline]. Khaw PT, Shah P, Elkington AR. Injury to the eye. BMJ. 2004 Jan 3. 328(7430):36-8. [Medline]. [Full Text]. Atabek C, Surer I, Demirbag S, Caliskan B, Ozturk H, Cetinkursun S. Increasing tendency in caustic esophageal burns and long-term polytetrafluorethylene stenting in severe cases: 10 years experience. J Pediatr Surg. 2007 Apr. 42(4):636-40. [Medline]. Kamijo Y, Kondo I, Watanabe M, Kan'o T, Ide A, Soma K. Gastric stenosis in severe corrosive gastritis: prognostic evaluation by endoscopic ultrasonography. Clin Toxicol (Phila). 2007. 45(3):284-6. [Medline]. Boskovic A, Stankovic I. Predictability of gastroesophageal caustic injury from clinical findings: is endoscopy mandatory in children?. Eur J Gastroenterol Hepatol. 2014 May. 26 (5):499-503. [Medline]. Litovitz TL, Normann SA, Veltri JC. 1985 Annual Report of the American Association of Poison Control Centers National Data Collection System. Am J Emerg Med. 1986 Sep. 4(5):427-58. [Medline]. Litovitz TL, Martin TG, Schmitz B. 1986 annual report of the American Association of Poison Control Centers National Data Collection System. Am J Emerg Med. 1987 Sep. 5(5):405-45. [Medline]. Dünser MW, Ohlbauer M, Rieder J, Zimmermann I, Ruatti H, Schwabegger AH, et al. Critical care management of major hydrofluoric acid burns: a case report, review of the literature, and recommendations for therapy. Burns. 2004 Jun. 30(4):391-8. [Medline]. Hatzifotis M, Williams A, Muller M, Pegg S. Hydrofluoric acid burns. Burns. 2004 Mar. 30(2):156-9. [Medline]. Yuanhai Z, Liangfang N, Xingang W, et al. Clinical arterial infusion of calcium gluconate: the preferred method for treating hydrofluoric acid burns of distal human limbs. Int J Occup Med Environ Health. 2014 Jan. 27 (1):104-13. [Medline]. Sigurdsson J, Bjornsson A, Gudmundsson ST. Formic acid burn--local and systemic effects. Report of a case. Burns Incl Therm Inj. 1983 May. 9(5):358-61. [Medline]. Chan TC, Williams SR, Clark RF. Formic acid skin burns resulting in systemic toxicity. Ann Emerg Med. 1995 Sep. 26(3):383-6. [Medline]. Yelon JA, Simpson RL, Gudjonsson O. Formic acid inhalation injury: a case report. J Burn Care Rehabil. 1996 May-Jun. 17(3):241-2. [Medline]. Amshel CE, Fealk MH, Phillips BJ, Caruso DM. Anhydrous ammonia burns case report and review of the literature. Burns. 2000 Aug. 26(5):493-7. [Medline]. Morley SE, Humzah D, McGregor JC, Gilbert PM. Cement-related burns. Burns. 1996 Dec. 22(8):646-7. [Medline]. Stuzin JM. Phenol peeling and the history of phenol peeling. Clin Plast Surg. 1998 Jan. 25(1):1-19. [Medline]. Brown VK, Box VL, Simpson BJ. Decontamination procedures for skin exposed to phenolic substances. Arch Environ Health. 1975 Jan. 30(1):1-6. [Medline]. Eldad A, Simon GA. The phosphorous burn--a preliminary comparative experimental study of various forms of treatment. Burns. 1991 Jun. 17(3):198-200. [Medline]. Chou TD, Lee TW, Chen SL, Tung YM, Dai NT, Chen SG, et al. The management of white phosphorus burns. Burns. 2001 Aug. 27(5):492-7. [Medline]. Clare RA, Krenzelok EP. Chemical burns secondary to elemental metal exposure: two case reports. Am J Emerg Med. 1988 Jul. 6(4):355-7. [Medline]. Harris JC, Rumack BH, Peterson RG, McGuire BM. Methemoglobinemia resulting from absorption of nitrates. JAMA. 1979 Dec 28. 242(26):2869-71. [Medline]. Simpson LA, Cruse CW. Gasoline immersion injury. Plast Reconstr Surg. 1981 Jan. 67(1):54-7. [Medline]. Alexander G, Rajacic N, Ebrahim MK, Ghoneim I. MEBO and hot bitumen burns. Burns. 2003 Dec. 29(8):863-5. [Medline]. Baruchin AM, Schraf S, Rosenberg L, Sagi AA. Hot bitumen burns: 92 hospitalized patients. Burns. 1997 Aug. 23(5):438-41. [Medline]. Edlich RF, Long WB 3rd, Gubler KD, et al. Citizen's Petition to Food and Drug Administration to ban cornstarch powder on medical gloves: Maltese cross birefringence. Am J Emerg Med. 2009 Feb. 27(2):227-35. [Medline]. Edlich RF, Wind TC, Heather CL, Thacker JG. Reliability and performance of innovative surgical double-glove hole puncture indication systems. J Long Term Eff Med Implants. 2003. 13(2):69-83. [Medline]. Milton R, Mathieu L, Hall AH, Maibach HI. Chemical assault and skin/eye burns: Two representative cases, report from the Acid Survivors Foundation, and literature review. Burns. 2010 Jan 18. [Medline].